Sales of F-Series trucks from Ford slowed slightly in the month of November relative to the same month last year, even as both months had the same number of industry selling days (25). Total sales came in at 72,108 compared to 72,769 last year. 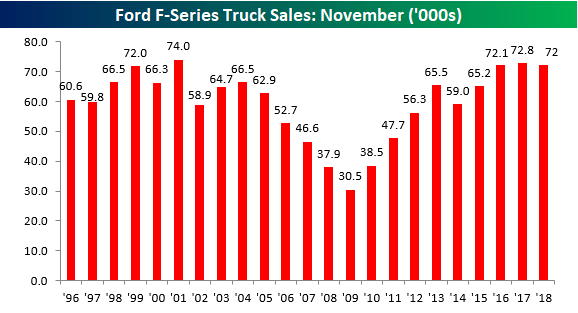 For the last three years now, November F-Series sales have been pretty much stuck at the 72K level. Looking back over time, though, the last three Novembers have been the 2nd, 3rd, and 4th best Novembers for sales going all the way back to 1996. 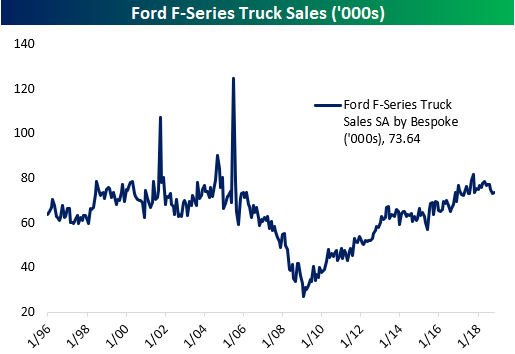 Sales of pickup trucks (specifically at Ford) are often a sign of strength or weakness in the small business and construction sectors, so it’s good to watch these readings for signs of strength of weakness. With 11 months in the books, total sales of F-Series trucks by Ford now stands at 822K, which is a 1.8% increase from the first 11-months of 2017. The only two years where sales were stronger through the end of November were 2004 (844K) and 2001 (827K). Depending on how things shake out in December, this year will likely go down as one of the top three years for Ford F-Series truck sales on record. 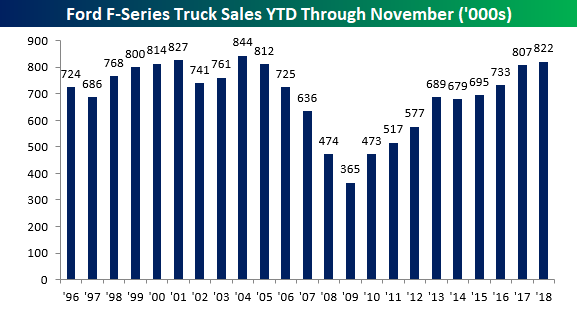 Finally, the chart below shows seasonally adjusted monthly F-Series truck sales by Ford. Similar to overall auto sales in the US, sales appear to have plateaued for the time being. They aren’t quite rolling over, but they certainly aren’t rising either.